Current Status: Seasonally injecting Ferric Chloride into the stormwater pond. In 1998, the PLSLWD constructed a ferric chloride (FeCl₃) treatment system to precipitate phosphorus out of stormwater from County Ditch 13, the main inflow to Spring Lake. The system was constructed as part of a Minnesota Pollution Control Agency (MPCA) Clean Water Partnership Implementation Project. In 2013, the District finished updating the Ferric Chloride Facility to meet new Minnesota Pollution Control Agency requirements, and increased the capacity of the system to treat water flowing through the area. Some of the key improvements to the system included upgrades to the line that adds the ferric chloride solution to the water and a bypass that will allow the system to continue to remove phosphorus when a lot of water is trying to move through the wetland to Spring Lake. 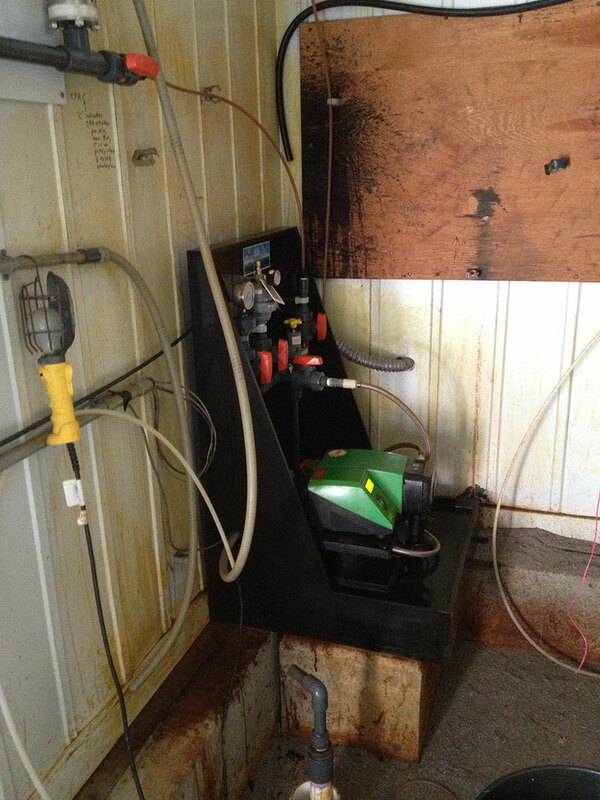 A look at the updated chemical feed pump inside the FeCl facility. Excess water, also known as runoff, from melting snow and rainwater in this area generally flows from the southwest to the northeast as it funnels through the County Ditch 13 system toward Spring Lake. As this runoff flows through the Ferric Chloride system, the facility injects liquid ferric chloride into the water at a controlled rate (32.5%) in a specially built pond area called a desiltation pond. Here the ferric chloride chemical attaches to the phosphorus in the water, then forms a solid material and falls to the bottom of the pond. This process “cleans” the water by removing phosphorus as it continues to flow into Spring Lake. Testing has shown that the Ferric Chloride Facility provides an estimated removal of 35% of the Total Phosphorus coming from the County Ditch 13 system. This essentially prevents an average of more than 500 pounds phosphorus from entering Spring Lake each year. And just one pound of phosphorus can produce 500 pounds of algae!